Introduction Short-term missions providing patients in low-income countries with reconstructive surgery are often criticised because evidence of their value is lacking. This study aims to assess the effectiveness of short-term reconstructive surgical missions in low-income and middle-income countries. Methods A systematic review was conducted according to PRISMA guidelines. We searched five medical databases from inception up to 2 July 2018. Original studies of short-term reconstructive surgical missions were included, which reported data on patient safety measurements, health gains of individual patients and sustainability. Data were combined to generate overall outcomes, including overall complication rates. Results Of 1662 identified studies, 41 met full inclusion criteria, which included 48 546 patients. The overall study quality according to Oxford CEBM and GRADE was low. Ten studies reported a minimum of 6 months’ follow-up, showing a follow-up rate of 56.0% and a complication rate of 22.3%. Twelve studies that did not report on duration or follow-up rate reported a complication rate of 1.2%. Fifteen out of 20 studies (75%) that reported on follow-up also reported on sustainable characteristics. Conclusions Evidence on the patient outcomes of reconstructive surgical missions is scarce and of limited quality. Higher complication rates were reported in studies which explicitly mentioned the duration and rate of follow-up. Studies with a low follow-up quality might be under-reporting complication rates and overestimating the positive impact of missions. This review indicates that missions should develop towards sustainable partnerships. These partnerships should provide quality aftercare, perform outcome research and build the surgical capacity of local healthcare systems. There is rising concern about the accountability, patient safety and sustainability of short-term reconstructive surgical missions; however, data on these parameters are lacking. Evidence provided by research on surgical outcomes is limited and of low quality, and the safety of missions is likely to be overestimated by studies in which the quality of follow-up is not reported. Our data suggest that engagement in sustainable development of the local healthcare system and the feasibility of conducting high-quality, long-term follow-up go hand in hand. We call for implementing longer-term outcome research of future missions. One approach that could provide a framework to conduct such research, is to implement diagonal development missions. These missions combine the positive impact of the short-term vertical inputs (e.g. providing surgical services) and long-term horizontal investments (e.g. development of sustainable healthcare systems), with the aim of improving access to, and capacity of, the local surgical healthcare systems in the long-term. These reviews provide valuable insights into medical missions in general. However, the diversity of medical and surgical missions is large, which hampers the interpretation of empirical data. This review aims to systematically review evidence on the impact of short-term reconstructive surgical missions specifically, and critically analyses the quality of the available empirical data. In this review, four key aspects are addressed: basic characteristics of missions, patient safety, health gains of individuals and sustainability. All original studies that analysed empirical data of short-term missions pertaining to reconstructive surgical care in LMICs were eligible. Studies lacking analyses of empirical data, reviews, studies of specialty surgical hospitals that provide continuous year-round care, mobile surgical platforms sent from in-country hospitals, studies in conflicts zones, studies not related to LMICs or studies of patients that were transported to high-income countries (HICs) were excluded. The studies were restricted to English and Dutch language. No restrictions were applied regarding publication dates. Duplicates were excluded. PubMed, Embase.com, Clarivate Analytics/Web of Science and Open Grey were searched up to 1 July 2018; Proquest up to 1 July 2017 (by CR, TH and JK). The last database was no longer available to us after 2017. The following terms—including synonyms—were used as index terms or free-text words: ‘plastic surgery’, ‘reconstructive surgical procedures’, ‘cleft lip’, ‘post-burn contractures’ or ‘noma’ combined with ‘medical missions’, ‘humanitarian’ or ‘charity’. More studies were identified by reviewing the bibliographies of retrieved studies. The full search strategies for all databases can be found in the online supplementary file 1. Studies were screened for eligibility by two independent investigators (TH and CR): in case of disparity, a third author was involved (MB). Two investigators independently extracted the data to create tables and figures (TH and CR). Basic characteristics of the missions, including mission length, number of patients who received surgery, and age and gender distribution. Patient safety by means of complication registration. Data were collected on three indicators: follow-up length, follow-up rate and complication rate. The follow-up rate was calculated by the number of patients who completed follow-up divided by the total number of patients who were included for follow-up. The complication rate was calculated as follows: the number of patients with complications divided by the total number of patients who completed follow-up. Health gains: data on surgical outcomes were collected, for example, improvement of range of motion, patient-reported outcome measures (PROMs) or DALYs averted per patient. All reported PROMs were recorded, for example on surgical outcomes, complications or the quality of care provided. All types of formats, questionnaires or any other tool describing these outcomes were included. Sustainable characteristics of missions: studies were reviewed for data on long-term partnerships, training objectives and involvement of local staff. Also, data on the cost-effectiveness of missions were collected. Missions were categorised either as stand-alone or consecutive missions to the same hospital, region or country. Flow diagram. LMIC, low-income and middle-income country. Regarding patient safety, nine studies (22%) did not report on complications. Twelve studies (29%) only reported a complication rate without reporting on follow-up length or rate. The overall complication rate in these 12 studies was 1.2%. Ten studies (24%) reported a follow-up length shorter than 180 days, with a mean follow-up rate of 81.3% and a complication rate of 7.1%. Ten studies (24%) provided a follow-up length longer than 180 days, reporting a mean follow-up rate of 56.0% and a 22.3% complication rate (table 3). Mortality after cleft surgery was reported in three studies, totalling 3 out of 14 551 patients included in these studies.16 28 64 For general reconstructive surgical missions—not specified for a single disease—one single study reported one death54 and no mortality was reported in contracture and noma missions. Twelve studies (29%) reported on health gains of the mission, reporting heterogeneous methods and outcomes (table 1). Methods used in cleft studies included photographic assessment of aesthetic outcomes,30 69 speech evaluation16 47 or DALYs averted.41 43 48 55 Three cleft studies evaluated speech functionality postoperatively, either by questionnaires61 or speech tests.16 47 Study methods were clear and showed overall improvements of speech. Four cleft studies reported on DALYs averted by cleft lip and palate repair surgery. DALYs averted per patient were 3.9,43 6.041 and 10.1 per patient.48 In three noma missions, a surgeon-reported outcome scale was used to score aesthetic and functional outcome.32 50 52 Overall findings showed that high-complex surgery is associated with greater risks of unsatisfactory results. Three studies used PROMs. One contracture study reported improvements in quality of life and disability by using validated questionnaires, and reported overall positive outcomes.63 Two cleft studies used self-developed questionnaires to assess PROMs, reporting positive results.61 66 None of the studies reported on patient-reported outcomes on the quality of the care provided. With regard to the sustainable characteristics of missions, 29 studies reported qualitative data (71%) on sustainability, while none of the studies reported quantitative data. Fifteen out of twenty studies that reported on follow-up and complications also reported on sustainable characteristics such as long-term partnerships or training activities (table 4). Ten organisations (24%) were engaged in longer-term partnerships, and thirteen missions (32%) returned to the same regions or hospitals. Few data were available on the frequency of missions, although several studies reported conducting yearly missions.32 35 43 50 Fifteen studies (35%) described teaching objectives as a goal during their missions. Activities mentioned were lectures,29 37 55 training of local surgeons,16 35 38 54 healthcare workers47 55 60 or fellowships in donor countries.16 54 55 However, none of the studies published empirical data on the effects of training or elaborated on how the training of local healthcare personnel was organised. Four cost-effectiveness studies were available for short-term cleft missions. Three studies reviewed the effectiveness per DALY averted, reporting US$33.94/DALY,48 US$56.0/DALY55 and US$247.42/DALY.41 The variation is explained by the differences in study populations, sample sizes, effectiveness measurements and ‘costing approaches’ used. 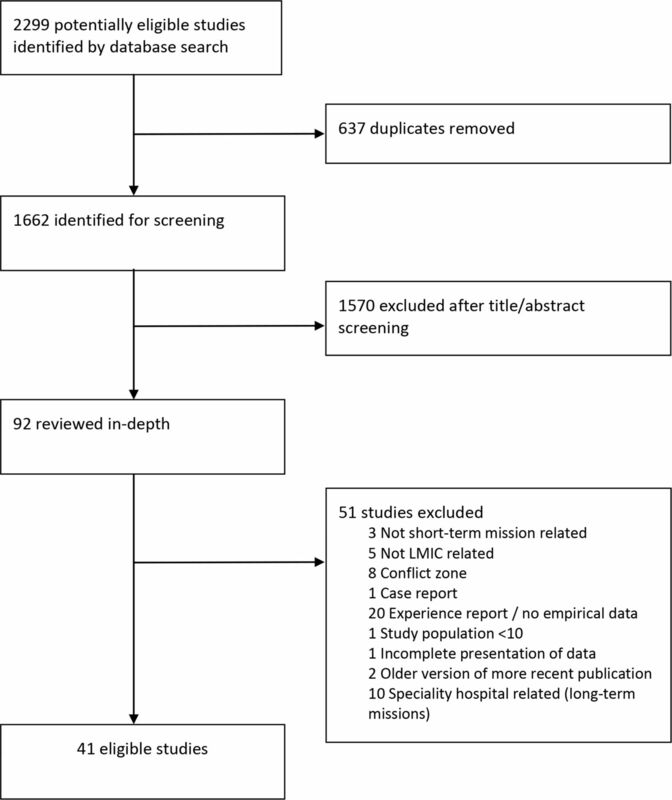 Several systematic reviews about short-term medical missions are available.7 9 10 12–15 This is the first systematic review that specifically assesses the quality of available data on short-term reconstructive surgical missions. Although all the studies included in our review reported a positive impact of surgical missions, the level of evidence remains low. It seems that follow-up of treated patients is a challenge. Although a majority of studies provide data on complication rates, the varying quality of this outcome measure makes it difficult to draw any conclusions. The results showed that reported complication rates were considerably higher when the quality and length of follow-up increased. This suggests that without data on quality of follow-up, there is a high risk of reporting bias due to under-reporting of complications. This also means that without comprehensive information on follow-up, the safety of missions is likely to be overestimated. Furthermore, studies used different control groups to benchmark their respective findings with regard to complication rates. Three of cleft care studies included compared complications between mission patients and patients who underwent similar procedures in a HIC. Results showed substantially higher complication rates in mission patients.34 49 60 One study showed that fistula risk was 15.6 times that for a US cohort.34 Maine et al49 state that complication rates were 20 times higher in the mission cohort compared with a US cohort, independently of whether the surgery was performed by Ecuadorian or American surgeons. It should be mentioned that comparisons of complication rates between HICs and LMICs cannot be made without taking into consideration that HICs have more resources at their disposal to limit complications. Therefore, we would suggest developing benchmark complication rates of LMICs, which can be used to assess the outcomes of short-term missions. Both organisations report lower complication rates than those reported in short-term missions. The centre of Operation Smile reports a short-term complication rate of 4.0% (cleft lip repair) and 15.8% (cleft palate repair), which is lower than the rates of their counterpart short-term missions.39 Smile Train studies report lower rates, between 0.88% and 3%.70 71 73 78 However, they note that there might be a risk of under-reporting or selection bias due to a dependence of Smile Train surgeons on payment-per-patient (risking fewer referrals when higher complication rates are reported) and a limited capacity of surgeons to treat complex cases.70 71 73 78 Furthermore, with only one Smile Train study reporting on follow-up lengths,73 these complication rates should be interpreted with caution. To be able to compare the strengths and weaknesses of different approaches of providing surgical care in a LMIC, there is a need for more high-quality studies.12 39 Apart from registrations of complications, such studies should assess long-term outcome using validated outcome measures and PROMs. Specialty hospitals, which provide services all year round, could provide good conditions for longer-term outcome research. This systematic review has several limitations. Literature on short-term reconstructive missions is scarce and of limited quality, limiting the strength of this review.25 As the majority of studies are cleft studies, the conclusions and recommendations of this review may not be fully applicable to other types of reconstructive surgical missions. The studies included represent just a small proportion of the many reconstructive surgical missions conducted worldwide. This may introduce a potential bias. It is likely that the small proportion likely does not fully represent the actual effect of all reconstructive surgical missions. In our view, this emphasises the need to incorporate standard monitoring and evaluations into missions. One example of such a diagonal approach is to aim for standardised tracking of longer-term outcomes of missions in strong collaboration with local partners. This might yield several advantages. Besides empowering local researchers and building an academic culture, outcomes can be reported back to patients and healthcare authorities. This will enhance the accountability of NGOs8 9 and allow for evaluations of the quality of care provided. This review shows that evidence for the effectiveness of short-term reconstructive surgical missions is both of limited substance and quality. Given the overall lack of evidence, there is an urgent need to incorporate outcomes research in future missions. This should include longer-term complication registration and measurements of health gains among individual patients. The effectiveness of training activities should also be evaluated. One approach to achieve this is to develop short-term missions towards diagonal development missions, which aim to build surgical capacity of local healthcare systems through long-term investments.
. Benefit–cost analysis for selected surgical interventions in low and middle income countries. In: Debas HT, Donkor P, eds. Disease control priorities. 3 edn. World Bank, 2015.
. Oxford Centre for Evidence-based Medicine—Levels of Evidence (March 2009), 2018. Available: http://www.cebm.net/oxford-centre-evidence-based-medicine-levels-evidence-march-2009 [Accessed 5 May 2018].
. Outreach model: 6 year experience of an Indigenous Nigerian mission in the surgical correction of facial clefts. PAMJ2018;29.
. Retrospective analysis of 200 severe post-burn cases in Cambodia and Bangladesh. Ann Burns Fire Disasters2005;18:5–10.
. Humanitarian activities of Interplast Turkiye: 6 years of experience in Uzbekistan for surgical treatment of cleft patients and related secondary deformities. Ann Plast Surg2016;77:494–8.
. Palatal fistula risk after primary palatoplasty: a retrospective comparison of a humanitarian organization and tertiary hospitals. Cleft Palate Craniofac J2018;16007.
. Surgery on burns sequelae in developing countries. Ann Burn Fire Disasters2017;30:47–51.
. A model humanitarian cleft mission: 312 cleft surgeries in 7 days. Plast Reconstr Surg Glob Open2015;3:e313.
. Global health: burn outreach program. J Burn Care Res2015;36:306–9.
. Improved early cleft lip and palate complications at a surgery specialty center in the developing world. Cleft Palate Craniofac J2018;1055665618762881.
. Short term surgical mission evaluation: a medical record analysis. Ann Arbor [PhD]. San Francisco, University of California, 2011.
. CIRPLAST: cleft lip and palate missions in Peru. J Craniofac Surg2015;26:1109–11.
. Unilateral cleft lip repair during charity missions: a consideration about simultaneously lip and nose repair. Minerva Stomatol2015;64:203–12.
. Grading quality of evidence and strength of recommendations.. In: BMJ. 328, 2004: 1490.
. Operation SMILE: how to measure its success. Ann Plast Surg2011;67:205–8.
. Cleft lip and/or palate: one organization's experience with more than a quarter million surgeries during the past decade. J Craniofac Surg2014;25:1601–9.
. Humanitarian cleft mission to central Africa—experience and suggestions. J Postgrad Med2011;25:373–-5.
. Scalable, sustainable cost-effective surgical care: a model for safety and quality in the developing world. Part III: impact and sustainability. J Craniofac Surg2014;25:1685–9. Contributors The contributorship will be proceeded with the plastic surgery department at VU University Medical Center Amsterdam.